Just based on my stats, I knew y’all liked my Doritos posts. Then my stats kept trending and even spiking up, and I knew just how much. Our Doritos Crusted Chicken Tenders and our Crunchy Doritos Taco Pasta Salad, continue to consistently be at the top of the heap of our most popular recipes. We knew we had to keep ’em comin’. Gotta give the people what they want, right? So keeping that in mind, and in that vein, I’m bringing you another Doritos chip-centric idea. 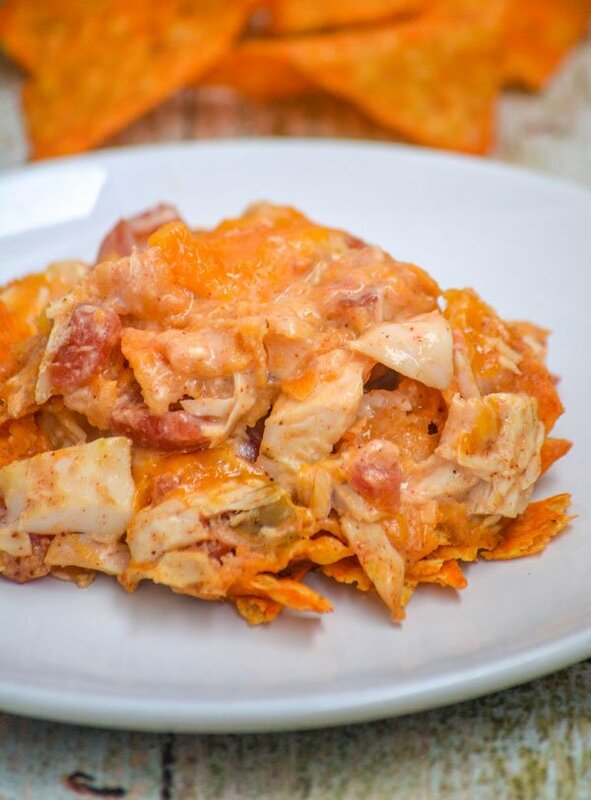 Cheesy Chicken Doritos Casserole is a sure fire hit that the whole family can, and will, get behind. Promise, the kids will clean their plates and even ask for seconds. This will become a much requested, honestly begged for, dinner dish. Casseroles are seriously the best, easiest dinners ever. You’ve got all of your ingredients and, pretty much, don’t have to have any real rhyme or reason to how they go in the dish. Just follow the loose instructions. Stir them all together. Bake as instructed, and out comes a delicious meal. Who invented the casserole? For real, because that person deserves an award for their genius! 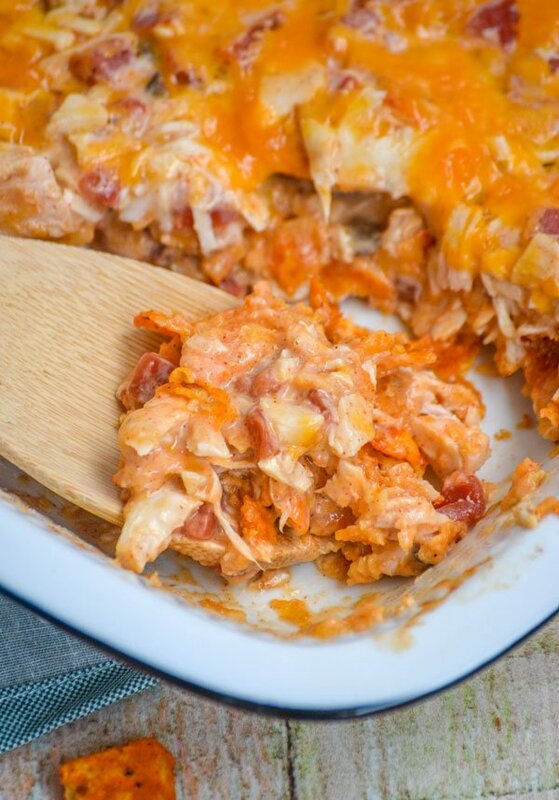 In this yummy Cheesy Chicken Doritos Casserole, all you’ve got is time- plus a dinner the kids will actually love. They can literally have their chips and enjoy them too. For dinner. How often does that happen in everyday life?! It’s every kid’s dream come true. Not gonna lie, this is total quick & easy comfort food. There’s nothing remotely healthy about any of the ingredients. They just taste good. That’s it. 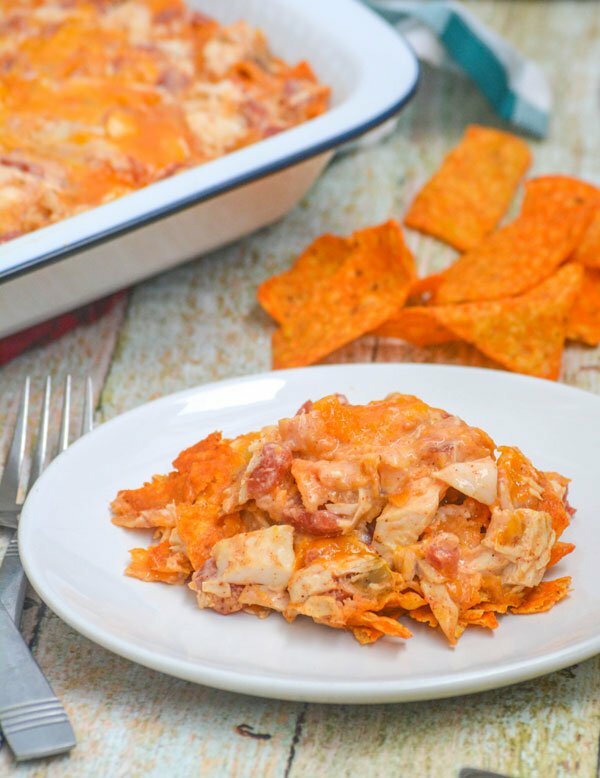 A rich, creamy, cheesy casserole- this Cheesy Chicken Doritos Casserole features chunks of delicious rotisserie chicken & diced tomatoes with green chiles. 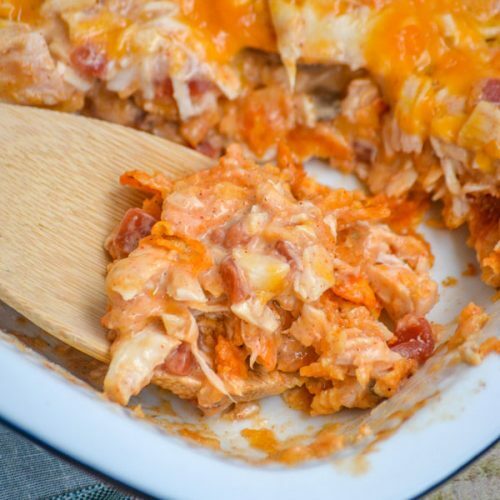 Stirred into a delicious sauce made up of canned cream of chicken soup, sour cream, and milk- it’s seasoned with taco seasoning and generously laced AND topped with shredded cheddar. 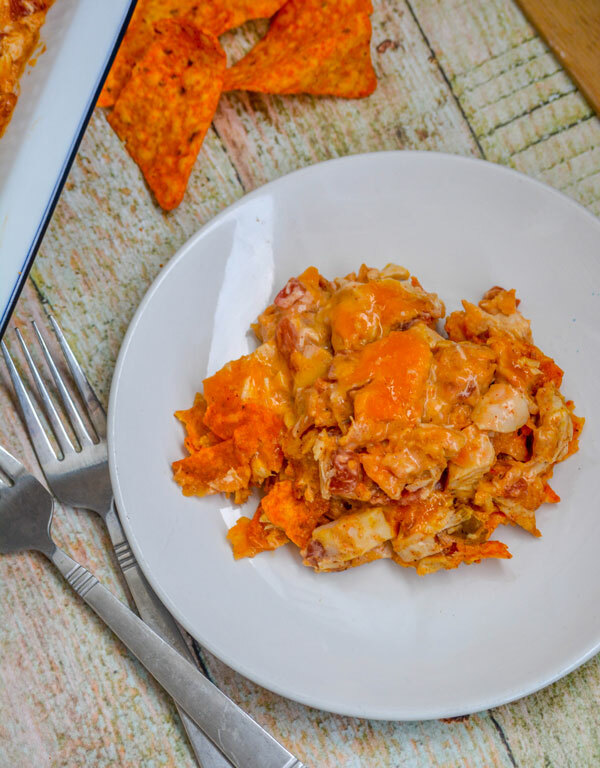 Cheesy Chicken Doritos Casserole is comfort food meant for the whole family to enjoy. 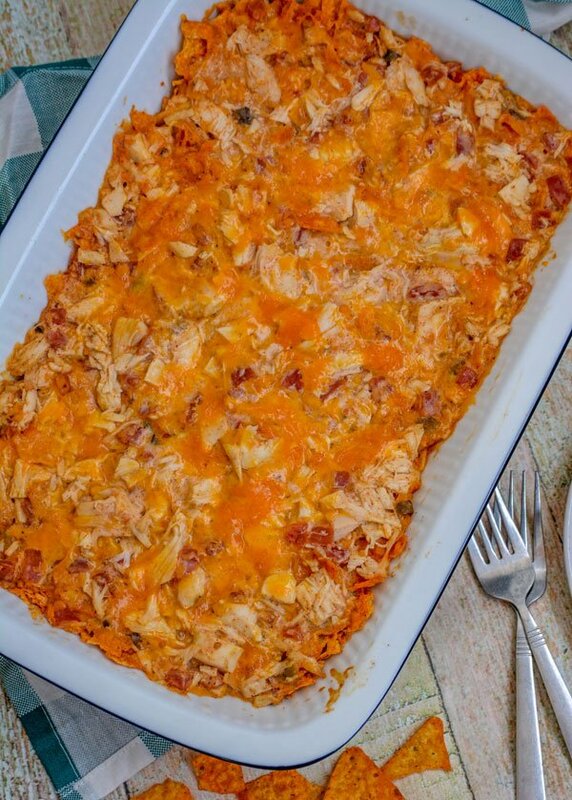 Other chicken casserole recipes you might enjoy: Creamy Poppy Seed Chicken Casserole, Loaded Baked Potato & Chicken Casserole, Chicken Noodle Soup Casserole, & Creamy Chicken Caesar And Wild Rice Casserole. 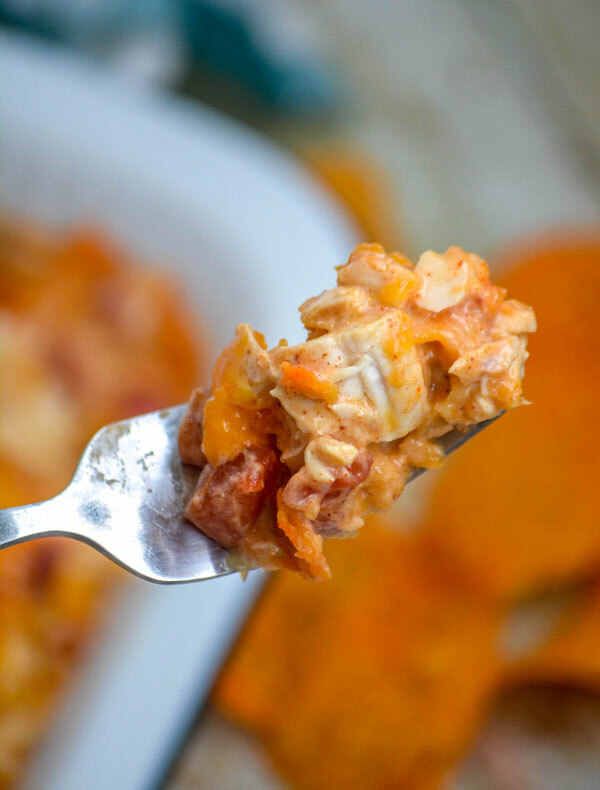 An easy, cheesy creamy chicken casserole- this one features chopped chunks of rotisserie chicken, diced tomatoes and green chilies, and one of America's favorite snack chips. In a large mixing bowl, add the chicken, 1 cup of cheese, soup, half & half, sour cream, tomatoes, and taco seasoning. Stir together until everything's evenly combined. Spray a 9x13" baking dish with non-stick cooking spray. Spread half of the crushed chips evenly out over the bottom of the dish. Add half of the chicken mixture, in dollops, evenly out over the chips. Use the back of a spoon the gently spread the mixture out evenly. Repeat the layers. Sprinkle the last 1/2 cup of cheese evenly out over the top of the casserole. Tightly cover the casserole with aluminum foil. Bake at 350 degrees for 30-32 minutes, or until hot & bubbly. Remove the foil, let the casserole rest for 2 minutes, and serve. mmm. delicious! my boys are asking if we can make it tonight 🙂 Thanks for sharing at FF!